Yesterday I had a lovely dinner at the Ninth Gate — a new Korean spot in my neighbourhood. I love the food there even though anything spicy just reminds me I’m cursed with GERD. The topic of my blog came up — I wasn’t fishing either, it just came up. Really, just like that. None of the attendees have blogs and my friend J. made the comment that most of the blogs she reads are written by people who either have a deep need to vent their unhappiness or want to talk about their myriad illnesses (or is it myriad of illnesses?). (I may well be guilty here as I have mentioned GERD far too often). My friend M. is deliciously cynical and I don’t think she reads blogs (except for mine, I hope). We took a picture and I asked if I could put it up. I just downloaded it and it looked rather bad so I won’t post it. I may share my feelings all over the internet but I still have some pride. Plus, the girls would kill me if I posted a shot of us looking so terrible. I’d be played by Janeane Garafolo. M. would be played by Sherry Stringfield. T. would get Sara Gilbert. we decided on Catherine Keener. Did we? I think they were kidding about my being discovered. You know, I think I’d have better luck trying to write some me some chicklit. At least if I were writing a book, no one would need to see my daily attempts at prose. 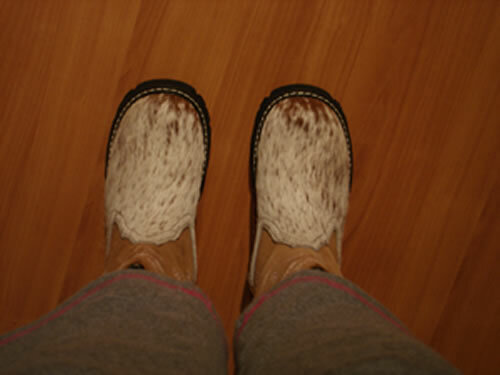 I promised my friend A. that I would post an image of my new boots — the actual pair that I have in my possession. 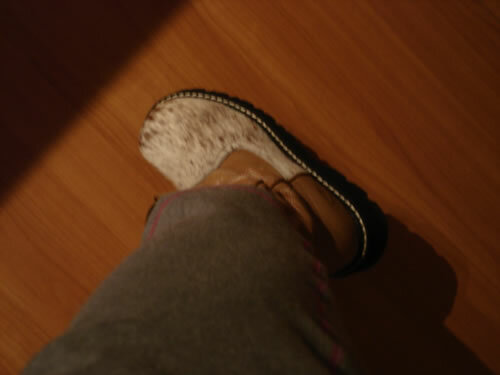 Here they are on my feet. Ignore the sweatpants — I am relaxing at home at the moment. I am Julia Louis Dreyfuss!!! J. — now I recall! Yes, you are Julia Louis Dreyfuss. I lost my mind for a moment. Can I switch and be Catherine Keener then? …who would play me in your movie ??? Thanks! I can’t wait to wear them. I guess I will need to wait unitl Fall. It was 33 degress today!